1/8 Off-road takes a beating on the track. Often these are the most heavily powered fastest cars on the track. Yes their run time is often limited to 10-12 minutes, but consider their nitro counterpart don’t have the 12awg wires and solder connections to deal with. The chassis flex alone in a car like this causes strain on the wires and solder joint they’re attached to. Good high strand count wire such as the Tekin Flex-Jacket wire holds up very well to this, but even it should be inspected and replaced from time to time. Let’s be honest here, those 5 12awg wires are the life blood an E buggy. Without them no power is fed from the battery to the rest of the car, and no power will reach the motor powering your car as well. If you start to see bulges underneath the silicone jacket it’s time to replace the wires. Fatigue points are at any solder connection, any connectors, and the esc. 1/10 Off-road may have less overall violent wear but the same example applies. The bouncing and inherent nature of off-road racing means while your pretty and neat wiring job lays nicely on the table, it’s moving under the body unless you’ve taken measure to secure it to the chassis. And if you do secure it, you had better make sure you’re accounting for some chassis flex. 1/10-1/12 On-road has less of these issues since they’re not seeing the vibration and impacts as off-road. But the pan car guys use a very soft, very flexible and often very small gauge wire to prevent the rear bod movement from being affected by the wires running to the motors. Due to this they replace the ABC motor wires more frequently. Poor solder joints: A good quality solder iron is critical to the performance and quality if your soldering joints. Don’t skimp here, good irons can be found for less than $100. You’ll have this for the rest of your hobby career if you take care of it. Poorly routed wiring: Take your time to layout your electronics in the car. Consider wire routing, length, and routing options BEFORE you secure it all to the chassis. I often see guys using extra wire or poor routing only to have both of those issue fixed by rotating the esc 180 degrees. Take your time and think it out. Wrong Wire Size: Use the proper wire size for your application. Do you race stock? If so sure you can use 14awg wire. If you race mod you may get away with 14awg wire but if the wires are getting up to the same temp as the motor, you’re walking a line of failure. The only time I can see using very small wire is when it affects the handling of the car such as in a pan car. In off-road there’s no reason to use anything smaller than 12-13awg unless you’re looking to scrub some weight. Wires that are too short, or too long: Wires that are too short will pull on the two components they’re attached to. This is most often the motor and esc. Consider the chassis flex your application may see, you’d be surprised to see how much flex can occur in the car. Wires that are too long are flopping around inside the car causing fatigue stress near the secured solder joint areas. Remember taking a metal close hanger and bending it back and forth to snap it apart? Wire routed poorly: Consider any moving parts in the car. You DO NOT want the wires coming into contact with gears, drive shafts, servos, steering parts, anything that moves. I’ve seen a very colorful fireworks show when a guy’s battery wires were consumed by the spur gear on his E truggy…yeah no Bueno. Good quality wire is money well spent. Wire with high strand count, flexible silicone jacketing, and pre-tinned is often the best used for the r/c applications. 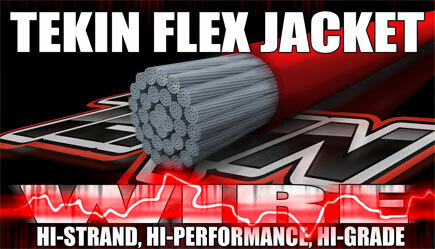 These are the specs and quality of the Tekin Flex Jacket wire which is what I recommend. Thicker jacketed wire is out there but it can often limit the routing options in the car, etc. We offer it in multiple gauges and lengths including 50’ spools.